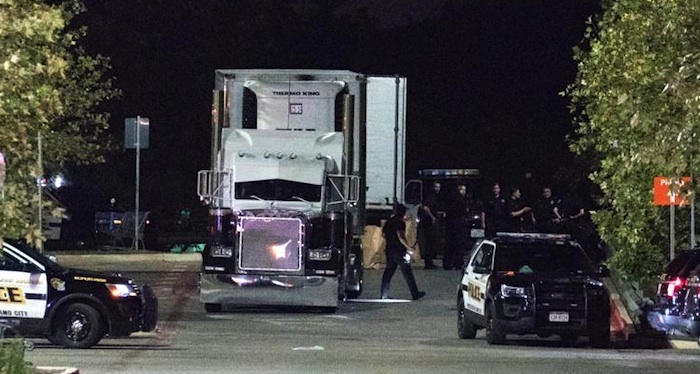 A truck driver was arrested early Sunday morning in a Texas Wal-Mart parking lot after authorities discovered 38 people crammed in the back of a sweltering tractor-trailer. Eight victims had already succumbed to the extreme heat and were pronounced dead at the scene. Several others were taken to the hospital in dire condition and one has since died. "This is a horrific tragedy. We're looking at a human-trafficking crime,” San Antonio Police Chief William McManus told reporters. He also said that many of the people in the truck appeared to be in their 20s and 30s but that there were also at least two school-age children. 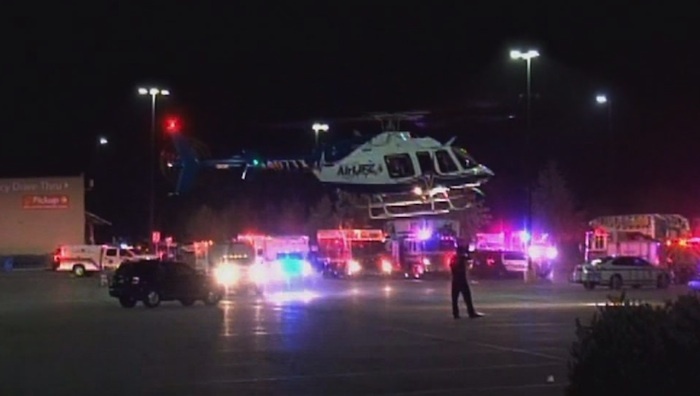 The truck was discovered just after midnight Sunday morning in a Wal-Mart parking lot off Interstate 35 in south San Antonio. Temperatures on Saturday had peaked over 100 degrees and had only dropped just below 90 degrees after 10 p.m. According to San Antonio Fire Chief Charles Hood, the people were illegal immigrants in the hands of smugglers who had no regard for their well being. They were being transported in the trailer of a refrigeration truck with no refrigeration, no working air conditioning and no water. “If they were to spend another night in that environment, you’d have 38 people who would not have survived,” he said. Surveillance footage also revealed that while the truck was stationed in the parking lot, a few different vehicles had pulled up beside it to take a small number of people out from the trailer and drive away. The whole operation had gone undetected until someone from the truck was so desperate for water that they approached a Wal-Mart employee in the parking lot and asked for water. It was enough to alert the employee's suspicions. “The employee came back with the water, called the police, and we found eight dead in the back of that trailer,” said the Police Chief. They found dozens of other people were suffering from extreme heat stroke and severe dehydration. “They were very hot to the touch. Each one of them had heart rates over about 130 beats per minute. A lot of them are going to have some irreversible brain damage,” said Fire Chief Hood. He confirmed that a total of 30 people were taken to hospital where one later died and 17 remain in critical condition. Authorities say that some of the survivors gave initial interviews and confirmed they were from Mexico. Investigators also said from the information gathered they believe there may have been well over 100 people in the truck at one point. While 38 were left inside, it is likely many had already been picked up from the parking lot and others had fled into the nearby wooded area to evade helicopters and foot patrols. The driver (whose identity has not yet been revealed) was arrested at the scene and is expected to face serious charges, along with others involved in the operation. Although the tractor-trailer belongs to Iowa based company, Pyle Transportation, the company's owner (Brian Pyle) said the driver owned the truck, managed his own delivery jobs and operated independently from his company. “It’s a common thing in the trucking industry … He had my name on the side, and I pay for his insurance. He makes his own decisions, buys his own fuel,” Pyle explained. While investigators haven’t confirmed where the truck had been driven from, McManus says these smuggling operations are routine in the area and many will often go undiscovered. However, the US Border Patrol has already made at least four truck seizures during the month of July in and around the area of Laredo, Texas.